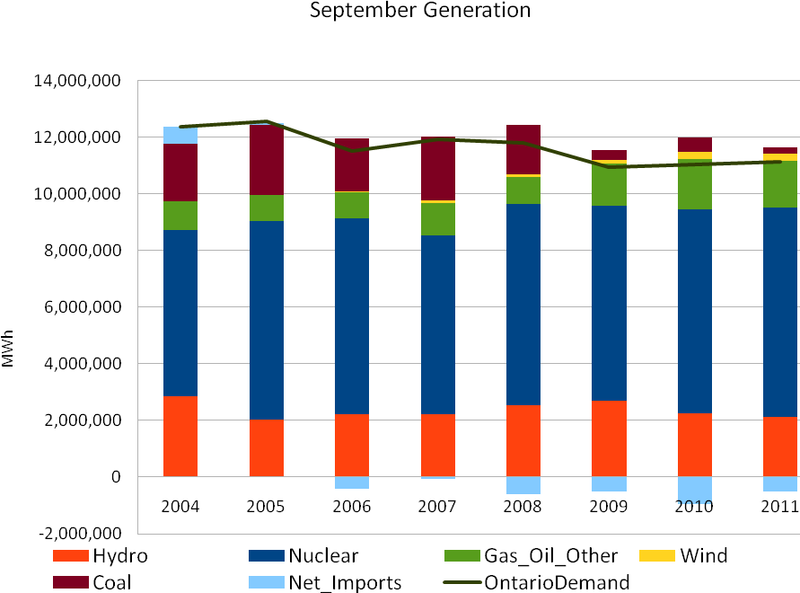 A quick overview of some stats, for September 2011, along with some views of the data not included in the IESO monthly reporting. 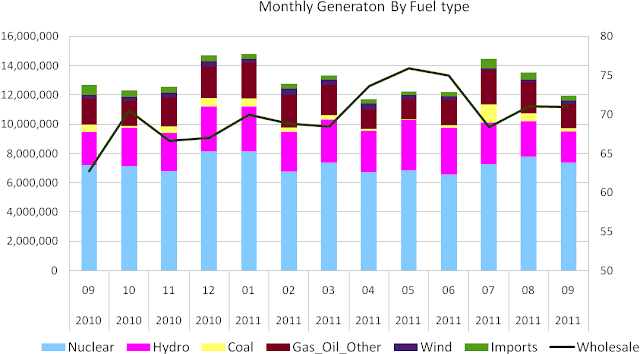 I offer these only as my own calculations based on freely available data from the IESO site. Mistakes in the data may be my own ... but it's unlikely. The Hourly Ontario Energy Price (HOEP) was low in September, with the difference between on and off ‘peak’ hours only about $5.69/MWh (or under 6/10ths of a cent/kWh). This lack of differentiation between peak, and off peak, pricing, is a trend. 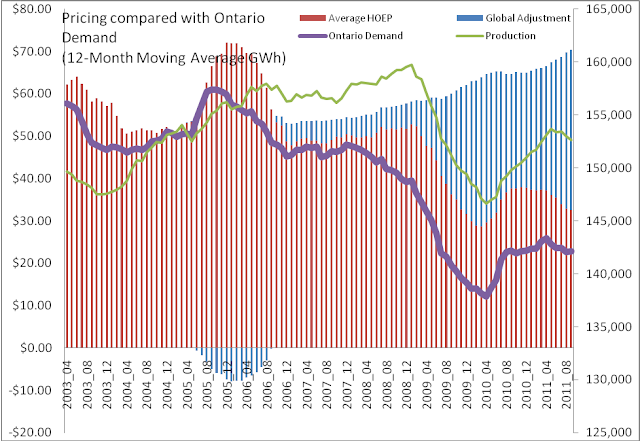 Ontario Demand averaged 15,476MW/h, with a minimum demand of 11,300 MW and a maximum of 21,552MW. 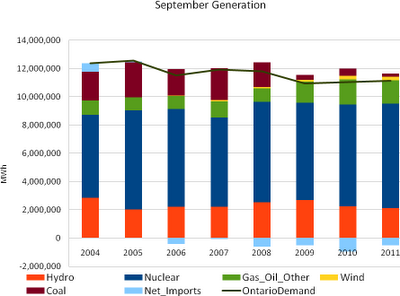 Total Ontario demand was about 11,142,969MWh. 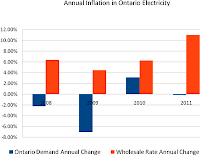 Supply was up slightly over September 2010, but remained less than 2% up from 2009's recessionary September demand. Hydro production failed to improve, despite water levels above 2010's depths, in the lower great lakes. Imports averaged 472MW/h while exports average 1172MW/h – the net export averaging just shy of 700MW. 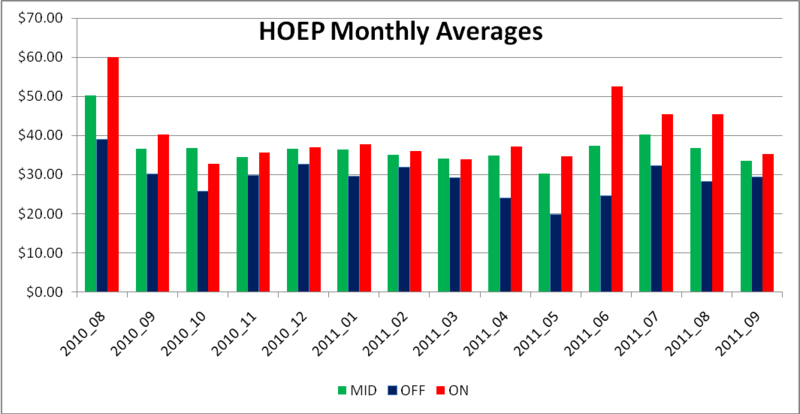 The 2nd estimate of the Global Adjustment is $39.11, which combines with the weighted average HOEP rate of $31.89 to provide a wholesale market commodity charge of $71/MWh. 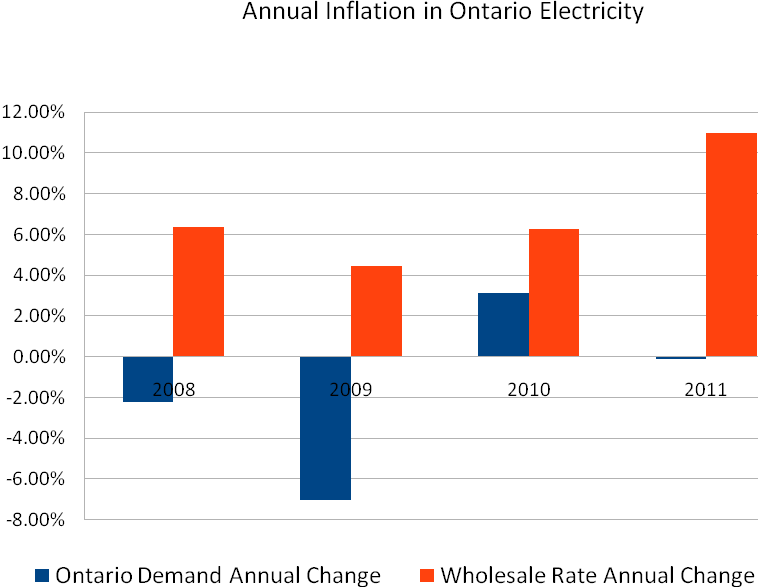 This compares to the rate of $62.72/MWh in September 2010 – a 13.2% increase. It's going to be finish of mine day, except before finish I am reading this wonderful paragraph to increase my knowledge.